Pacific Rim looked a bit like Transformers, but it ended up being a very different type of movie: Godzilla vs. Transformers, with the world at stake. The Kaiju - picture giant sea monsters, like Godzilla but bigger - are trying to destroy Earth, and it's up for the humans, who control Transformer-like robots called the Jaegers, to finish them off. 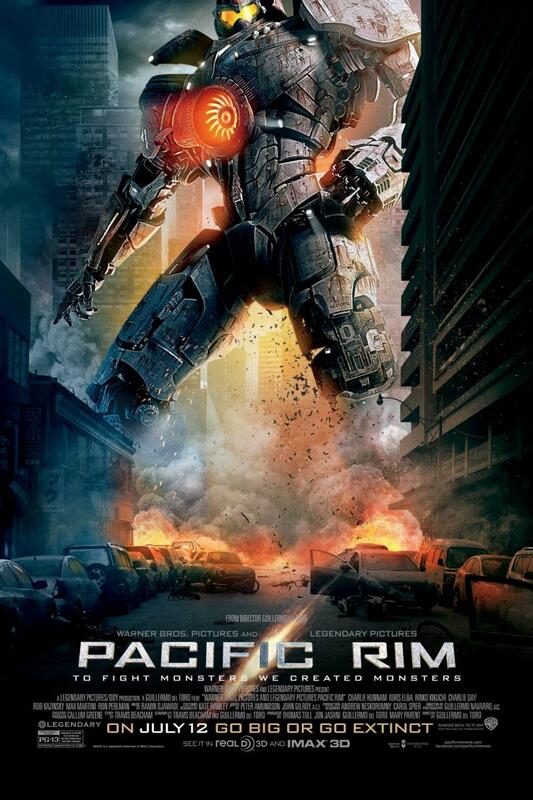 The War has been going on for many years now, but in Pacific Rim, they try to stop the Kaiju once and for all. Raleigh Becket (Charlie Hunnam) is a cocky twenty-something who controls a Jaeger with his brother, Yancy (Diego Klattenhoff). The way the Jaegers work is that the two brothers sync up their brains, and one controls the left side of the gigantic robot while the other controls the right side. After a fatal accident, however, we flash-forward five years, where Jaegers are being phased out, and giant walls are being constructed instead, to keep the Kaiju out. Raleigh is now a construction worker on one of those walls, at least until Stacker Pentecost (Idris Elba), his old boss, comes to seek him out. Raleigh's old Jaeger has been reconstructed, and Stacker wants him to operate it again; Raleigh figures it's better than being a construction worker, so he follows Stacker to Hong Kong, where he meets Mako Mori (Rinko Kikuchi), a woman who might just have a chance at matching his superb fighting skills. Together, Mako and Raleigh must employ teamwork in operating the Jaeger and killing the Kaiju, who are multiplying at an alarming rate. I saw this movie in IMAX 3D, and the 3D was a bit blurry at times; later, others said that if you didn't look at the screen "straight on," it would appear to be blurry. The IMAX, however, was fantastic, and I highly recommend seeing it in that format. All of the action sequences in this film are enthralling, and although the movie could have used a little more backstory, we can overlook that for the sake of these scenes. Some of the most interesting scenes are also where Raleigh and Mako are "in each others heads," while they control their Jaeger; there's a memory scene where Raleigh sees Mako as a little girl, fleeing from a Kaiju and being rescued, and that was one of the most compelling scenes in the movie, in my opinion. Yes, see this movie. Charlie Hunnam is great as Raleigh, but some of the other standouts were Idris Elba as Stacker, who has been operating Jaegers for a long time, and Charlie Day as Dr. Newton Geiszler, a wacky scientist who is a "Kaiju groupie," as another character refers to him - he's obsessed with investigating the Kaiju. Ron Perlman is also good as Hannibal Chau, a black market dealer of Kaiju remains; stay throughout the credits for an additional scene featuring him, as well. If you like movies like Transformers or even disaster-type films like Titanic, I would recommend Pacific Rim, and it should do very well at the box office during the summer season. Pacific Rim is in theaters today, July 12th, and is rated PG-13 with a runtime of 131 minutes. 4 stars out of 5.